Weight: (F) 202 lbs. (R) 179lbs. (S) 161lbs. Nobel prizewinning physicist Professor Martin Stein designed the Hudson Nuclear Facility, a full automatic nuclear generating plant. His former assistant, Dr. Danton Black, falsely accused Stein of stealing his plans for the plant. This causes the government to forbid the plant's opening until Black's charges were investigated. Stein, however, was determined to start the plant's operation that night. That evening high school student Ronnie Raymond decided to join Edward Earhart's anti-nuclear power group, which was protesting the plant's opening. Raymond objected when he learned that Earhart planned on blowing up the plant. Stein activated the plant's nuclear reactor. Earhart knocked both Raymond and Stein unconscious and left them in the main reactor room with a bomb. Raymond revived moments before the bomb exploded, increasing the scale of the ongoing nuclear reaction. Stein and Raymond were bombarded with radiation and fused into the nuclear man called Firestorm. Firestorm captured Earhart, became a super-hero, and eventually joined the JLA. After Firestorm's first meeting with the League, which included his induction, he became the mental slave of the Satin Satan. League members Batman, Black Canary, Green Arrow, Red Tornado, Superman, and Zatanna, along with curious bystandards Cliff Carmichael, Doreen Day, and Cal Remington, tackled the Satin Satan, who was actually possessed by the demon Sataroth, and freed the nuclear hothead. Over the next months, Firestorm proved himself an able Leaguer, helping fellow heroes whenever they needed. Firestorm aided the Flash in defeating Superman's old nemesis the Atomic Skull; he teamed up with Batman to destroy the Hudson Nuclear Reactor since it had become sentient in the same explosion that formed both Firestorm and Multiplex; and, even though he was possessed for a time, joined the League to defeat Starro, the starfish conqueror that had enslaved most of New York City. David Drake, another expert scientist, had created the Manta, a nuclear- powered bathysphere. Captain Anton Hammer, head of the project aboard the Neptune explorer, had pressured both Martin Stein to O.K. the nuclear stockpile and Drake to O.K. the launch. After the Manta launched, a sea storm hit and severed the communications between the Neptune and the Manta. Stein summoned Firestorm and rescued the Manta, but Hammer shot Drake as he emerged. Drake fell back into the bathysphere, as a short circuit exploded the nuclear craft. Drake was transformed into the creature called Typhoon. Driven mad by the accident, Typhoon sank the Neptune and headed for Florida, but was finally stopped by Firestorm. Eventually, Martin Stein became able to remember Firestorm's adventures after they split apart. Ronnie revealed Firestorm's long history to Stein, and Stein agreed to remain active as Firestorm. Firestorm was critical helping the Red Tornado find his origin, convincing the Tornado Champion to remerge with the Tornado Tyrant and form the Red Tornado. About the same time, Killer Frost had escaped from her frozen prison a third time, and joined Ultra-Humanite's version of the Secret Society of Super-Villains. Killer Frost defeated Firestorm, and the Society held him, and nine other members of the Justice League and the Justice Society of Earth-2, hostage in a limbo between worlds. After the Earth-2 villains doublecrossed the Earth-1 villains, Killer Frost, with Signalman, the Cheetah, and the Floronic Man, freed the ten heroes from their prison, only to have all the villains imprisoned in the same limbo. While Martin Stein finally settled down with a stable job, working at Concordance Research, Firestorm had many adventures. Superman revealed his secret identity of Clark Kent to Firestorm when the two teamed up against the villain Kris Kross. While Ron Raymond, and the rest of the class from Bradley High, went on a field trip to the New York Museum of Natural History, Raymond's teacher John Ravenhair was transformed into the insane Black Bison. Black Bison attacked New York Senator Walter Reilly and his daughter Lorraine, but was defeated by Firestorm and restored to normal. Longtime Green Lantern villain Hector Hammond, who possessed a superhuman intelligence, developed the power to have his intellect leave his body in prison. Hammond had an android Ace constructed and recruited a new Royal Flush Gang. The Royal Flush Gang attacked various Leaguers across the country, including Firestorm, and had them put into comas. The only person who realized that Hammond was behind this was Martin Stein, but he was trapped in Firestorm's body. Eventually, Stein battled Hammond on the astral plane, and when Stein emerged victorious, the Leaguers came out of their comas. Killer Frost, meanwhile, escaped from her prison in limbo and decided to exact revenge by freezing the entire populace of New York City. Keeping all but Mayor Koch and Firestorm free, Frost made Firestorm her unwitting slave. Frost wanted the most macho male, actor Curt Holland, as her slave, and sent Firestorm to fetch him. Firestorm, however, recruited the Justice League to aid him. Professor Stein and the Red Tornado developed a super- freeze engine which they hid in Tornado's torso. Disguising Tornado as Holland, they got him close enough to Frost to freeze her once again. Firestorm proved his worth over and over again. He teamed up with the League, the Justice Society of America, and the All-Star Squadron in the year 1942 to defeat the Crime Syndicate and Per Degaton. He also, about this time, defeated longtime Flash foe Pied Piper, the Canadian terrorist Plastique in her first appearance, and longtime enemies such as the Typhoon and the Hyena. During this time, Firestorm teamed up with the League, the New Teen Titans, and Superman to stop the invasion plans of the evil Brainiac. He also, with the League, helped defeat the ancient Atlantean wizard Garn Daanuth and the longtime League foe Professor Ivo. Firestorm played a key role aiding the cat-like Reena and the League defeat the mutations of the animalistic Rex Maximus. About this time, Firestorm aided the Justice League, the Outsiders, and the World's Finest duo of Batman and Superman fight the self-styled god Zeta and his Pantheon on a myriad of worlds. Firestorm and the League also defeated the villain Paragon in his first appearance and helped both them and the Justice Society defeat the evil Johnny Thunder of Earth-1. Firestorm also joined the Justice League and the New Teen Titans in celebrating Supergirl's anniversary landing on Earth. Firestorm joined the League in defending the Earth against the Martians, who returned to our solar system with the intention of conquering our planet. When the Justice League failed, and Martian Manhunter single-handedly fought off his own people, Aquaman, then leader of the League, decided to re-evaluate the League's purpose. Aquaman decided to disband the original League and form a new League that could commit totally to the team. At first Firestorm was enraged by Aquaman's decision, but soon realized the truth in his words. Firestorm opted to remain with the League, but Stein made Raymond realize that they could not commit 100%. Thus, Firestorm left the League. 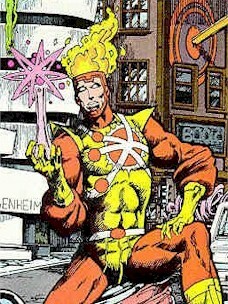 Firestorm was one of the first team of heroes recruited by the Monitor to combat the coming Crisis on Infinite Earths. In the midst of his latest battle with Killer Frost, was approached by Harbinger and the second Psycho Pirate, and the four joined other heroes of various parallel Earths in defending these Earths against the Anti-Monitor, a demonic counterpart of the Monitor from the Antimatter Universe. First, Firestorm and his team fought off the Anti-Monitor's shadow demons that infiltrated the Monitor's satellite. Then, the Monitor sent Firestorm and Killer Frost to ancient Camelot on Earth-2 to team up with Sir Justin the Shining Knight and Vandal Savage to protect one of five tuning forks placed in various times on various Earths to protect them from the Anti-Monitor's destructive powers. After the Monitor's death and five of the Earths temporarily protected, Firestorm joined a strike team of heroes from the various Earths, led by the Supergirl of Earth-1 and Superman of Earth-2, into the Antimatter Dimension to attack the Anti-Monitor's fortress. Firestorm's powers, altered in the anti-dimension, proved little help, but the heroes managed to set the Anti- Monitor fleeing. In the aftermath of the battle in the Anti-Matter dimension, Firestorm joined the heroes of the Earths at Superman's funeral, and was one of the heroes who confronted the newly-formed Red Tornado. With the Anti-Monitor weakened, the villains of the various Earths, led by Brainiac and Luthor, took control of three of the Earths: Earth-X, Earth-S, and Earth-4. Firestorm joined the strike team of heroes that saved Earth-S, battling such villains as the Penguin and Validus along the way. In the end, the three Earths were liberated and the villains defeated. Firestorm also took part in the massive battle between the remaining heroes and the Anti-Monitor and his Qwardian armies. In the end, the Anti- Monitor was destroyed by the Superman of Earth-2 and the Superboy of Earth- Prime. After the Crisis, Firestorm aided the new Justice League battle Darkseid's fallen angel, Brimstone. Brimstone defeated Firestorm, the new League, and a time-travelling Cosmic Boy before being destroyed by the new Suicide Squad in their first mission. The Russians tried creating a clone of Firestorm from his cells--and succeeded only in creating a soulless inhuman creature codenamed Svarozhich! Thanks to this man who calls himself Rasputin, you learned Firestorm was actually the Fire Elemental. And that the only way to defeat it was for you and Mikhail to become Firestor permanently. And so the final, true Firestorm was created. No, that's not true, either, because for the first time I was excluded from the process and, according to a vision Firestorm had--I was originally meant to be the human component in the matrix! Both Ron and Mikhail were released from the Matrix by Firestorm so they could live their lives. The Svarozhich-Firestorm was controlled by Rasputin and sent into space, with Martin Stein. The Firestorm Complex was remade. This Firestorm fought Brimstone in the Sun, but Brimstone's implosion caused a black hole in the sun. Firestorm went through the whole to seal it from the other side, and found the black hole a gateway to another region of the universe. Ronnie has been diagnosed with leukemia. When the doctors suggest radiation, Ronnie says, "I've had enough radiation for one lifetime," he feels violently ill after his first round of treatment. He screams "I'm burning up!" and becomes Firestorm again. It appears he still has his powers, but no control over them. Extreme Justice team shows up to help control Firestorm, and to get him to join them. Amazing Man absorbs Firestorm's excess power. At this point Ronnie is calmed down and is in the classic Firestorm costume. Professor Stein appears as the Fire Elemental. Ronnie first has to get Professor Stein to control his now awesome-level powers, and then Ronnie can hear an offer the professor has. The Fire Elemental-Professor wants Ronnie to join the matrix to permanently be part of the Elemental's essence. Ronnie initially refuses, and the Elemental takes Ronnie through a grand tour to show him what he'd be missing. The elemental explains that he has been losing his "humanity" and needs Ronnie to appreciate all the wonders of the Universe. Ronnie still rejects the offer, because he doesn't want to give up the life he has. Martin claims that that isn't fair, since Martin had to give up half his life for Firestorm. Ronnie angrily replies that that was different, and that Ronnie never asked for any of it to happen. The Elemental-Martin considers all that Ronnie said, and the Elemental asks Captain Atom to help guide Firestorm (as Martin had). Then the elemental removes the leukemia from Ronnies molecular structure, and gives Ronnie back Firestorm's powers. The Fire Elemental again goes off to explore, and Ronnie accepts Captain Atom's offer to join Extreme Justice. Ron is now a male underwear model. He also took up drinking. (Because of the illness? A change in attitude?). Ronnie later joins the mission in space against Avatar, and is one of the "lost" heroes who eventually locate Superman's body. Upon his return to this era, Ronnie has taken up with the new Titans team. Through an act of will on the part of either man, Ronnie and Stein fuse to become Firestorm. When the merger occurs the man who didn't will it disappears and Firestorm appears in the place of the man who did. Although their bodies are fused their consciousness remains separate. Raymond controls Firestorm while Stein advises, unless Raymond is unconscious at the time of the merger then Stein is in control. When they revert to their normal forms they appear next to one another. Firestorm principle power is the ability to perceive and rearrange the atomic structure of matter. He can also alter the density of objects, including his own body, even to render himself intangible. Firestorm can project bolts of nuclear energy, fly at great speeds, and absorb explosive force and radiation into his body harmlessly. However, if he directs his power against organic matter other than himself, he causes only an energy feedback that may harm him. Also, he can't project energy bolts while intangible.